There are nearly 20,000 KFCs worldwide but success isn’t guaranteed. Here are 12 that kicked the bucket when the financial chickens came home to roost. No one symbol captures the essence of KFC like the spinning bucket sign, and likewise a discarded and decrepit bucket sign perfectly illustrates the downfall of a fast food fried chicken icon. The bucket above, which looks supernaturally spooky by night, merely appears sad when spied by day in a line of other such signs. You’ll find it outside the American Sign Museum in Cincinnati, Ohio. 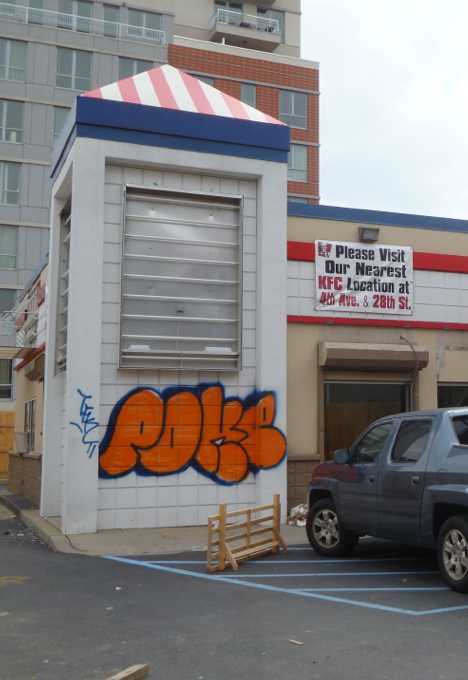 According to its Wikipedia entry, “Park Slope is an affluent neighborhood in northwest Brooklyn, New York City.” Looks like this affluent area just caught a case of affluenza, however, with graffiti taggers moving quickly to blight the abandoned KFC outlet at the corner of 4th Avenue and Warren. Conveniently, the closed store posts an official sign directing curious (and hungry) taggers to their next nearest location. Is Flickr user RetailByRyan95 psychic or something? The intrepid photojournalist must have had a premonition when he visited a now-abandoned KFC restaurant in Hayes, VA in April of 2009. Just over three years later, Ryan was back to record the forlorn state of the abandoned outlet at 2413 George Washington Memorial Highway in the York River Crossing shopping center. Hope he packed a lunch on his return visit. 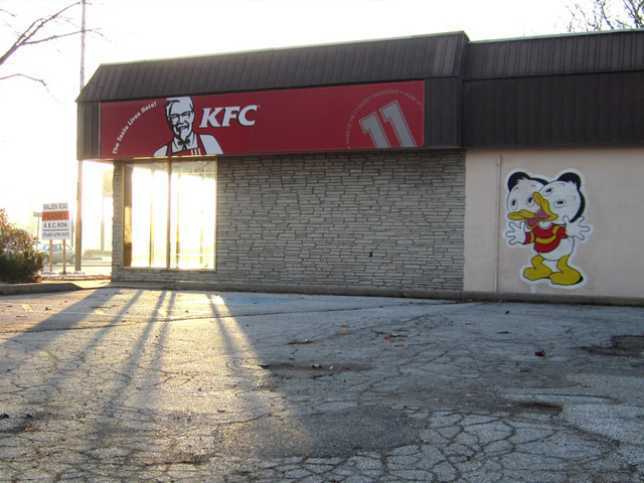 According to Ryan, this KFC closed on October 21st of 2011 and the entire building was demolished in early November of 2013. 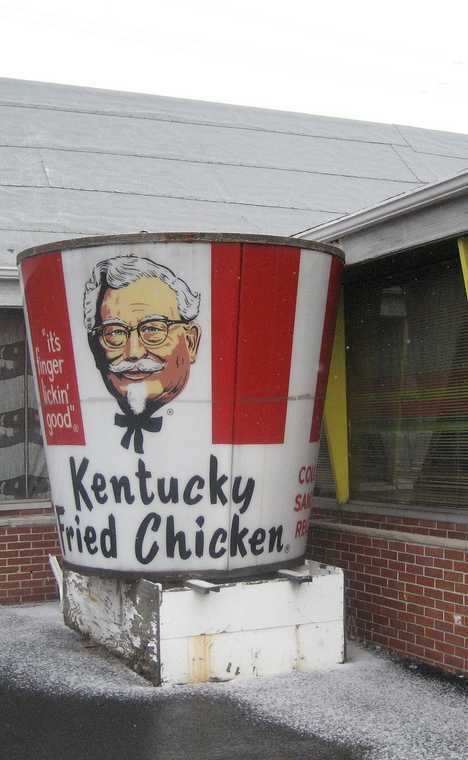 Somehow this old-style KFC big bucket escaped the fate of its store on Route 30 by the Westmoreland Mall and ended up outside the Antique Co-op store over on Rt. 119, according to Flickr user paper or plastic. KFC chicken buckets can run but they can’t hide, however, and after spending some time in this incongruous location it was hit by a car and completely destroyed. Police are seeking an elderly man dressed in a white suit and black string-tie, last seen licking his fingers and cackling gleefully.